Flame, also known as fire, is a kind of effect in the Super Smash Bros. series that debuted in Super Smash Bros.. Targets hit by flame attacks are momentarily be set on fire, flashing red and orange, and in Ultimate, will appear visibly scorched. They cause Blast Boxes, Bombers, Link's Bombs and Remote Bombs, and Young Link and Toon Link's Bombs, to detonate instantly. They do no damage to Red Pikmin, which will not flinch. In Super Smash Bros. Brawl, due to type effectiveness they deal 1.1x knockback to Ivysaur and 0.9x knockback to Squirtle. In Brawl and SSB4, flame and electric attacks make Hotheads grow larger and more powerful (in Ultimate, all attacks can do this). Flame attacks are boosted by Flame Attack stickers in Super Smash Bros. Brawl's The Subspace Emissary and in Super Smash Bros. Ultimate by the Primary Spirit skill Fire Attack ↑, the Support Spirit skill Fire & Explosion Attack ↑, as well as certain Spirit Battle conditions. Flame attacks are resisted by Flame Resist stickers in Brawl and the Spirit trait or skill Fire/Explosion Resist ↑ in Ultimate. These attacks also deal more damage to fighters equipped with a Primary Spirit with the trait Fire Weakness in Ultimate. 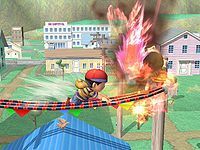 Flame is by far the most common "elemental" attack in the Super Smash Bros. series, with over half of Brawl's roster having access to at least one flame attack. Most explosive-type attacks use the flame effect. In addition to natural stage hazards, the Spirit Battle condition "The floor is lava" creates a hazard that inflicts flame damage.